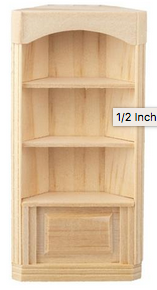 Half inch scale corner bookcase ready for you to stain or paint to match your decor. The piece is 1 3/4 inches wide, 5/8 inch deep and 3 5/8 inch tall. Bottom is a decorative panel and does not open.